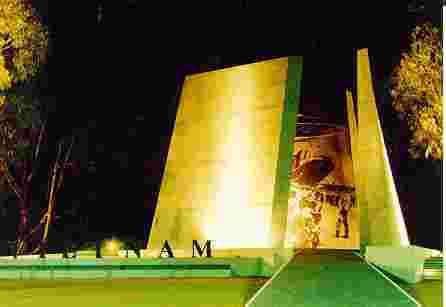 The memorial remembers those who suffered and died in the Vietnam War from 1962 to 1973. The campaign for a Vietnam memorial dates from the ‘Welcome Home Parade’ held in Sydney on 3 October 1987 and dedication took place exactly five years later. It is the joint work of architect Peter Tonkin and sculptor Ken Unsworth and responds to the design competition requirements to express ‘the link between the Australian Vietnam Forces and the original ANZAC Force’ and also to represent ‘the controversy at home’. 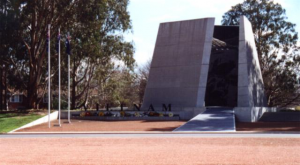 The external design was limited by ceremonial and parade considerations and by other memorials along Anzac Parade. The designers wanted to incorporate the four elements of earth, wind, water and fire. The domed shape of the internal floor represents the earth and the whole structure is open to the wind. A moat defines an island across the water and removed from the outside world. Unfortunately, cost restraints and the fire risk meant a permanent flame wasn’t permitted so fire is represented by the sunlight across the face of the memorial. The exterior is constructed of three cast-in-situ prestressed concrete forms or stelae, which project 9.5 metres above the base podium. (‘stelae’ is Greek for ‘headstones’.) Each stele is tapered and inclined to the centre of the memorial. In the original design the stelae had flat surfaces but the designers decided that twisting them would invoke a feeling of movement and give them light and shadow. They are tapered and inclined to the centre, symbolising commemoration and contemplation. Suspended from the stelae and forming the centrepiece of the memorial is a granite ring or halo symbolising the spirits of the dead being lifted from the earth. Sealed within one of the stones of the ring is a scroll bearing the names of the 508 Australians who died in the conflict. On the inner face of the western stele is etched a larger than life representation of members of the 7th Royal Australian Regiment being airlifted by U.S. helicopters from the fishing village of Lang Phuoc Hai to return to Nui Dat. It is a blow-up of an Army public relations photo taken by Sgt. Mike Coleridge and preserves a typical real life image of the conflict. The image was engraved in situ on 400 pieces of variable sized, triangular South Australian Imperial Black granite. Eighty-one one metre photographs were stuck on top of two layers of sandblasting tape and, in a very delicate operation, an engraver’s tool was used to cut through the photographs and two layers of tape without touching the stone. The exposed stone was sandblasted to a depth of 1 mm to create the grey effect and the tape was then removed, leaving behind the image. The northern stele has fixed to it a series of quotations in stainless steel lettering. The designers originally suggested half a dozen quotations which they thought would add to the interior and lessen the impact of blank walls. The committee agreed with the idea but wanted more than six so they called for suggestions from veterans and from the many submissions selected 34 which preserve the language and slang of the war. No attribution for the inscriptions is provided on the wall as the assessors felt that this best served the sense of the consistent and equal value to be placed upon each quotation. Each letter is made of 3mm gauge stainless steel, 65mm high using a Futura typeface. The inner wall of the southern stele is left as plain unadorned concrete and functions as a site of personal contemplation, separate but not divorced from the specific memories recalled by the other walls. In front of this wall and off centre of the entire internal space is the ‘Memorial Stone’ – a monolith of black granite, which functions in part as an altar, in part as the earthbound component of the contemplative inspirational function. The inner space or podium is tiled in black granite and is bounded by a moat. To the north there is a small forecourt area covered in gravel, to the rear of which is a wide flight of stairs leading to the exterior of the northern stele, and beyond that to an entrance ramp at the north-western edge of the central structure. Looking to the south there is a larger forecourt area also surfaced in gravel. At the southern edge of this forecourt there are three 9-metre flagpoles. At the rear or western edge there is a retaining wall with a low shelf. This is an area designated for the laying of wreaths. Surmounting this low wall are large steel letters spelling VIETNAM. Further to the south is a landscaped turf ramp, also leading from street level to the level of the plinth and to the rear south-western ramp. In the landscaped turf area surrounding the central building there are three concrete memorial ‘seats’ At each end of these memorials is the name of one of the six Australians recorded as Missing In Action. The memorial was dedicated on 3 October 1992 and re-dedicated 10 years later on 5 October 2002. THE RAAF DUST-OFF PILOTS HAD NO LIGHT AND SHOWED GREAT SKILL IN COMING DOWN. SUNRAY WAS DIRECTING THE LIGHTFIRE TEAM – BUSHRANGERS – FROM HIS POSSUM. THE PART PLAYED BY ARTILLERY WAS DECISIVE. WHAT WE DID ON THE BATTLEFIELD IN THE MORNING WAS ON OUR LIVING ROOM TV SCREENS THAT NIGHT. THE NVA HUGGED OUR WITHDRAWAL AND ENGAGED THE DUST-OFF CHOPPERS. THE TANKS WENT AHEAD OF THE INFANTRY IN APC’S. HOBART WAS BRACKETED REPEATEDLY BY MEDIUM TO LARGE SPLASHES. THE ENEMY JOINED OUR COMMAND RADIO NET, THREW COLOURED SMOKE AND ALMOST SUCKED THE CO INTO A LANDING. BIG CONTACT TONIGHT IN THE BINH BA RUBBER. TROOPS HIT WITH RPG’S. READY REACTION FORCE WENT OUT IN APC’S. NOBODY’S GOT 365 DAYS AND A WAKEY TO GO. – OVER 24 HOURS ON DUTY WAS DONE ON MOST OF THE DAYS MENTIONED. MAGPIE 35, HIT MY SMOKE. HON ME ISLAND FROM RADIATING. CONTACT – STAND BY DUST OFF. INESCAPABLE OBLIGATIONS WHICH FALL ON US BECAUSE OF OUR POSITION, TREATIES AND FRIENDSHIP. THERE WAS NO ALTERNATIVE BUT TO RESPOND AS WE HAVE. OF AUSTRALIAN INVOLVEMENT IN THE WAR. I DON’T SEEM TO HAVE MANY FRIENDS SINCE I CAME HOME. IF YOU WEREN’T THERE, YOU CAN’T UNDERSTAND. MORE THAN EVER BEFORE TV SHOWED THE TERRIBLE HUMAN SUFFERING AND SACRIFICE OF WAR. RICHARD NIXON. FROM 1965 ARMY UNITS IN VIETNAM CONSISTED OF ABOUT 50% NATIONAL SERVICEMEN AND 50% REGULAR ARMY. ABOUT 200,000 NATIONAL SERVICEMEN SERVED IN VIETNAM. THIS IS PUFF THE MAGIC DRAGON IN YOUR LOCATION. LIKE CHICKEN MAN – THERE WERE CHARLIES EVERYWHERE! BARREL, WAS USED TO HELP SELECT THOSE FOR CONSCRIPTION. THROW SMOKE! – I SEE GREEN – AFFIRMATIVE! PHANTOMS AND SPOOKY WERE INVALUABLE, BUT THE HELICOPTER GUNSHIPS GAVE THE BEST AIR SUPPORT. FOR THE FIRST TIME IN MODERN HISTORY THE OUTCOME OF WAR WAS DETERMINED NOT ON THE BATTLEFIELD BUT ON THE TV SCREEN. OUR FAMILY FOUND ITSELF DIVIDED OVER VIETNAM. AS A VARIATION WE CLOSED THE VILLAGE CORDON IN DAYLIGHT AND SEARCHED NEXT MORNING. WE MUST LEARN TO UNDERSTAND NVA BUNKER SIGN – TRACKS: LATRINES, DEAD BRANCHES, STREAMS. AT VAMPIRE PAD OUR OWN DOCTORS AND NURSES TOOK OVER – WE KNEW WE HAD MADE IT. ON 3 OCTOBER 1987, 25,000 VIETNAM VETERANS MARCHED IN A WELCOME HOME PARADE THROUGH SYDNEY, TO THE CHEERS OF HUNDREDS OF THOUSANDS. IT WAS THE GREATEST EMOTIONAL OUTPOURING WITNESSED IN DECADES.